In a CNBC interview this morning T. Boone Pickens suggested that oil may climb above $150/barrel this year, which was promptly followed by a $2 rally in the commodity. Birinyi Associates promptly distributed a note to clients which shows that Mr. Pickens' comments should not be ignored. His historical comments, shown below versus an oil price chart, have since been reproduced by Reuters and by CNBC. 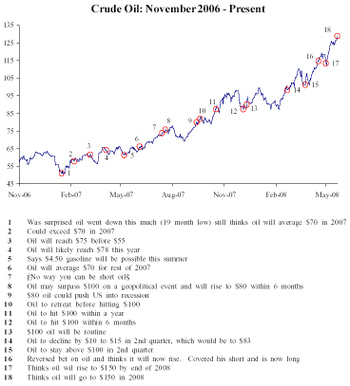 Do bullish calls on oil from an oil man which show good correlation during an uptrend in oil make him accurate? What about when oil tanks (not calling it)? Any damned fool can be a genius in a bull market. If I recall correctly, he was very wrong for long periods of time over the last generational period (30-40 years). I don't feel that oil has peaked quite yet. Most of us are just complaining about the oil problem and not really doing anything about it. With the state of the oil supply shortage we are seeing huge problems with the price.